With more than 40 years’ experience and repair systems installed across the world, Monaflex is the leader in providing equipment for the repair and vulcanization of damage to all tyres, from the largest off-the-road (OTR) earthmovers to the smallest truck. The same effective technology is used for the revolutionary new ultra lightweight repair system for conveyor belts, the CRS. Monaflex were the original pioneers of the use of inflatable pressure bags and all our systems provide exceptional conformity to the unusual contours of a tyre and are equally effective in conveyor repairs. The result is always a perfectly moulded repair that is the strongest in the industry. Monaflex’s extensive industry experience, coupled with ongoing customer feedback, means we are able to provide the most effective, user friendly tyre repair solutions. With none of the heavy components and steel framework associated with old repair technology, even the complete system for the largest OTR tyres in the world can be transported easily in the back of an average car. This completely portable system has opened up enormous opportunities for our customers, including mobile repair services and multi-site operations. Unlike other fixed plate mechanical and hydraulic ‘spotter’ repair systems, the Monaflex inflatable components allow the repair to conform perfectly to the complex contour of the tyre. The result is a distortion-free, feather-edged repair with maximum adhesion; these repairs will be stronger and last longer than any others in the industry. Utilizing simultaneous heat and pressure (inside and outside of the tyre injury) the Monaflex system can cure both the plug and patch at the same time, resulting in a quicker repair. Every Monaflex system repairs all the major areas of the tyre without the need for extra components, such as sidewalls, shoulders or crowns. For those suffering a high volume of sidewall injuries, Monaflex’s range of rapid assembly specialist sidewall systems provide a quick and easy solution. 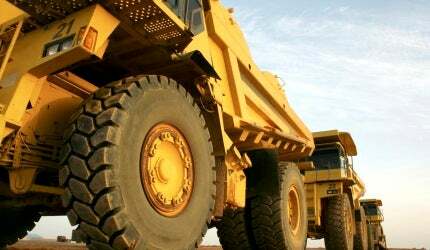 Solutions are even available for giant earthmover tyres. In addition, the Monaflex bead repair system removes the need to scrap costly earthmover tyres due to minor damage in the bead area. In the modern mining industry, resource management is vital and the use of Monaflex repair systems will ensure that downtime is minimized and cost efficiency maximized. Remote locations can be easily accessed with our lightweight, portable systems. Repairs can be set up and executed quickly and with effective, long lasting results. Monaflex will cut waste, reduce downtime and minimize capital investment. Doing away with the traditional heavy framework associated with Conveyor repair, the Monaflex CRS uses lightweight inflatable airbags and heat pads to apply the necessary heat and pressure consistently across the repair area. All systems are portable and collapse down to be easily transported in the back of any support vehicle. Rapid, lightweight and producing superior repairs, this hot vulcanization system is designed for easy use in the most challenging environments. A revolutionary design and complete flexibility in conveyor repairs. Monaflex pioneered the use of inflatable pressure bags and flexible heat pads to provide perfectly moulded repairs that are the strongest in the industry. This repair methodology has proven extremely popular and Monaflex now exports systems to locations around the world. Monaflex has now turned its extensive experience to the conveyor industry, culminating in a new quick and easy repair solution. With significant investment in research, development and its people, Monaflex will continue to provide the quality products and innovative repair solutions that are now synonymous with the Monaflex name. Monaflex will be showcasing a new generation of vulcanization components, as well as providing an exclusive world preview of our brand new conveyor system at Electra Mining 2018. Monaflex pioneered the use of inflatable pressure bags to provide outstanding conformity to the unusual contours of a tyre. The result is a perfectly moulded repair that is one of the strongest in the industry. From this innovation Monaflex developed a lightweight yet tough system that can manage the vulcanisation of repairs in all tyre sizes. Monarch has more than 50 year's experience installing tyre repair systems for industries. Monarch has released a new heat pad design for the Monaflex tyre repair system. Maximising the lifespan of your OTR tyres has a significant impact on budgets. Bead damage is a common problem in many operations we encounter and often, unnecessarily, results in many costly earthmover tyres heading for the scrap heap. Our new generation of Heat Pads and Airbags are stronger, lighter and even more durable. Correct sidewall maintenance and repair is a crucial part of maximizing the lifespan of OTR tyres and minimizing time lost due to unforeseen issues and failures. Three simple care tips to maximise the lifespan of your Heat Pads. CONEXPO-CON/AGG 2017 promises to be huge! In February, we'll be heading to the Tire Industry Association's Off-the-road Tire Conference, which this year is located in Oahu, Hawaii. The pressure on organisations to minimise downtime and decrease expenditure is ever increasing, and to many the essential, yet costly and time-consuming area of conveyor belt maintenance is challenging.